Leopolis Hotel, a landmark Ukrainian hotel has successfully optimized online distribution connectivity to improve their hotel occupancy and revenue, by leveraging RateTiger. The property, which has been using RTConnect for channel management, ARI updates and Reservation Delivery has seen a substantial improvement in efficiency resulting in minimizing overbookings and reducing workloads. 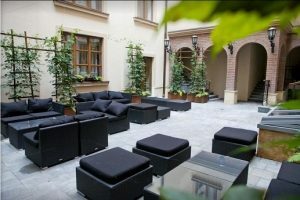 Leopolis is the only luxury hotel in Lviv located right in the heart of the historical part. Located in the restored building that is listed as a UNESCO World Heritage Site, Leopolis is a popular choice for both business and leisure travellers. Given that the hotel attracts guests from across the continent along with domestic travellers, it is important for the hotel to be present in all leading online sales channels and metasearch sites in Europe. RTConnect, the SaaS based distribution solution providing fully integrated, two-way XML connections to over 350 global and regional online booking sites, is helping the property to establish seamless connectivity between the OTAs and its PMS. “By using channel manager by RateTiger we are saving a lot of time and get a lot of extra revenue. Everything works very efficiently and during our cooperation we did not have any overbookings at all,” said Ostap Shpachuk, Director of Sales and Marketing, Leopolis Hotel. “My favourite tool is rate weight, as it allows to manage rates for separate channels, room types and rate plans – we use it a lot indeed. I also like the velocity of the support team,” said Ostap Shpachuk, Director of Sales and Marketing, Leopolis Hotel. Leopolis has been accessing Reservation Reports, a key module in RateTiger to monitor channel performance and map demographics of their customers. Through the booking analysis, the hotel is identifying the top-performing channels to offer customized packages to their key markets. They are also utilising RateTiger’s on-demand intelligence tool – RateTiger Shopper, to monitor the competitor rate movements and improve pricing decisions for better profits.